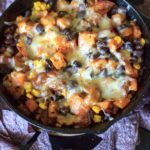 Butternut Squash and Veggie Bake – ready in under 30 minutes, loaded with vegetables, topped with cheese and served with tortilla chips. Option to spice it up with jalapeno and hot sauce. Dinner is served! This is a meal prepared in 30 minutes and takes only one pan! Cast iron cooking is some of my favorite. Save even more time by buying butternut squash already cubed. Saute the squash and cumin for 10 minutes or so, then mix in black beans, corn, and a tomato. Squeeze some lime juice in there. Top with your favorite cheese and dig in. Serving with tortilla chips is optional but works really well. If you want to make it spicy (you saw that coming if you know me!) throw some sliced jalapeno in with the veggies, and/or serve with hot sauce/sriracha. I seriously can’t get enough of this dish. Super easy, delicious and healthy! Clean up is a breeze too. Before you go, I also want to share a new way for you to save this recipe and other recipes from across the web. It’s a website (also an app) called Yummly. You’ll see at the top and bottom of this post (and all my posts!) an icon that says “Yum.” Once you sign up with a yummly account, clicking that button that will save any post to your recipe box. Based on your the recipes you save from around the web, it even will start to make recommendations for you! If you want to see all the recipes I currently have featured on Yummly, please check out my publishers page! 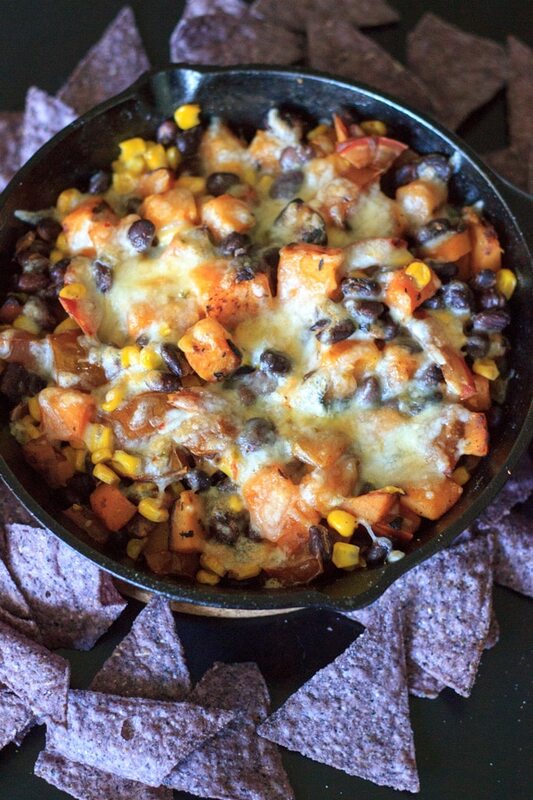 Butternut Squash and Veggie Bake - loaded with vegetables, topped with cheese and served with tortilla chips. Option to spice it up with jalapeno and hot sauce. Dinner is served! Heat oil in medium cast iron skillet. Add butternut squash and cumin, and stir-fry over medium-high heat for 10-12 minutes or until tender. Reduce heat to medium-low. 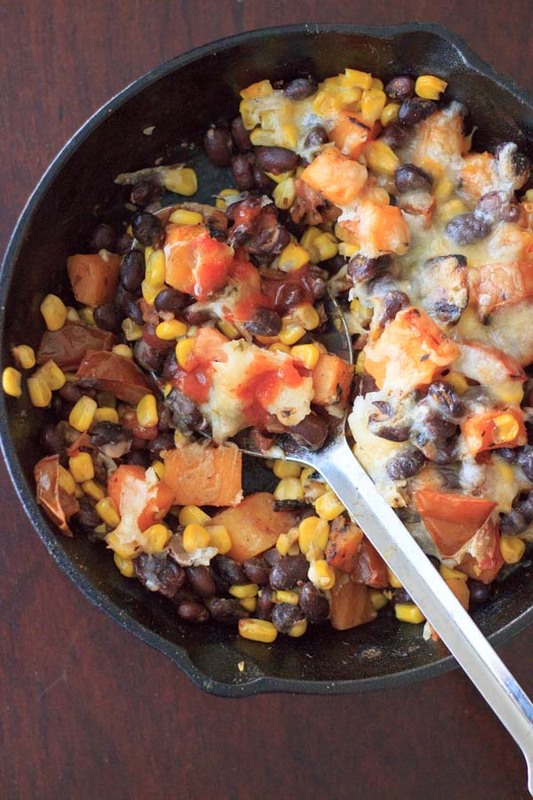 Add black beans, corn and tomato and stir together for additional 2-3 minutes. Turn off heat. Add lime juice, salt and pepper (to taste) and stir together. Add shredded cheese on top of vegetables. Turn on oven to high broil, and cook for 4-5 minutes or until cheese browns. Serve hot, with tortilla chips. If you like it spicy, feel free to add a diced jalapeno in with the veggies and/or sriracha sauce for serving. Like this recipe? 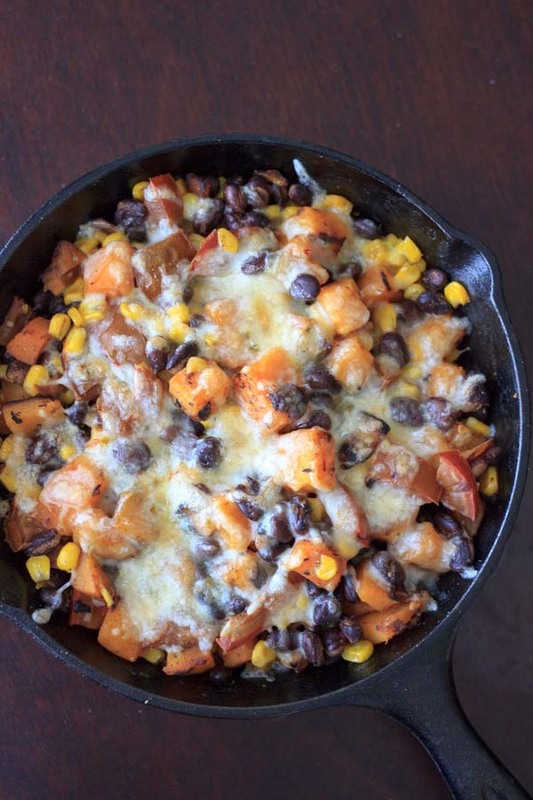 You may also like this butternut squash quinoa casserole. This looks wonderful! I’m putting together a Cinco de Mayo BuzzFeed roundup- may I include your recipe in the mix? Yes of course, thanks so much for asking Scott! Let me know when to look for it, I can’t wait to see the others! This looked and sounded so good I had to make it for dinner tonight! The cumin really added a nice flavor to this dish. I may throw in some black olives next time I make it. Loved this! Quick and easy to make AND clean up. That is all my favorite. Less time in the kitchen, more time for eating. Happy to hear you liked this Meg! I’ve never worked with butternut squash, do I cook it before cubing? No. I buy pre-cut squash but you can google how to cut butternut squash to see instructions!